After the dreary winter and spring months of downpour, most of us are more than ready for the bright, shiny days of summer. Imagining beach trips, sunbathing, and cool dips in the pool, we can’t wait for the clouds to clear and the sun to come out, even if it’s only for the short span of the summer months before the unrelenting rains descend yet again. However, while summer is full of fun and relaxation, it’s one of the worst times for your skin, and especially your face. The sunshine may feel warm and refreshing, but the ultraviolet rays hitting your skin wreak havoc on the aesthetic health of your face. The National Institute on Aging has named sunlight as a primary cause of wrinkles, dryness, and age spots. Hence, for those seeking to preserve the young, clear, smooth and vivacious quality of their skin, steps must be taken to combat the detrimental effects of UV rays. Most people assume that they don’t need skin care until their skin begins to form wrinkles or have other issues. However, most people are unaware of the fact that our skin actually begins aging at about age twenty. 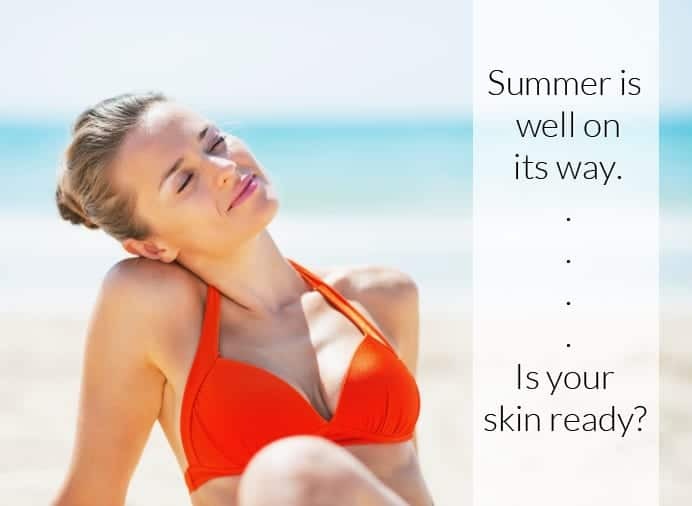 Hence, working with a licensed medical aesthetician to sustain or regain your skin’s youthful, healthy glow is an important part of cosmetic care during summertime. Chemical Peels Restore Facial Glow: Recommended for Summertime! One type of effective skin-renewal, a chemical peel, not only improves and enhances overall skin clarity and glow, but it also reduces signs of aging such as facial lines and wrinkles. These procedures are recommended to prepare skin for the upcoming summertime sun! The chemical peel process revitalizes your skin. During the days prior to the treatment, the patient is instructed to cleanse their skin regularly and apply various types of cream, lotion, or other preparatory skin formulas. The process begins by the aesthetician cleansing your skin. Then, an advanced formulation of alpha-hydroxy acids, beta-hydroxy acids, and even a glycolic compound is applied and allowed to soak into the skin. This specific compound tailored to your skin type. The next part of the chemical peel involves treating the skin with essential antioxidants which are proven to revive and fortify your skin. Then, a clean, fresh, water-based moisturizer is applied, followed by an SPF (Sun Protection Factor). Dr. Bryan McIntosh recommends a series of 3-5 peels spaced approximately two to four weeks apart. Start today by scheduling your free consultation and prepare your skin for summer! Each of these procedures has a special application for certain skin conditions, which emphasizes the importance of working with a licensed medical aesthetician. An aesthetician is able to expertly assess the current condition of your skin and make proper treatment recommendations that are both professional-grade and comprehensive. Your skin health is a serious issue, and it’s paramount to find a doctor that agrees. Dr. Bryan McIntosh has been praised by past and current patients as an understanding cosmetic surgeon that listens to the needs of his patients and works to accomplish their cosmetic goals. Get ready for summer with a free consultation with Dr. Bryan McIntosh and restore the healthy protection and clarity that you face needs to shine in the sun!